Spectrasonics presents: MOONCHILD - "Cure"
Now more powerful than ever, expanded hardware synth integration, new patches, arpeggiator upgrades and much more! 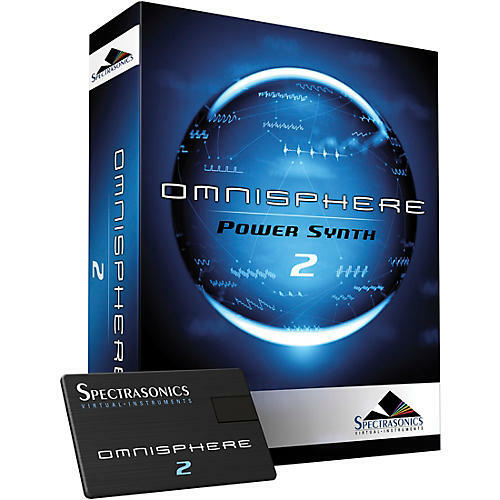 Omnisphere® is the flagship synthesizer of Spectrasonics-an instrument of extraordinary power and versatility. Top Artists all over the world rely on Omnisphere as an essential source of sonic inspiration. This award-winning software brings many different types of synthesis together into one amazing-sounding instrument that will spark a lifetime of exploration. Hardware Synth Integration Omnisphere is the only software synth in the world to offer a Hardware Synth Integration feature. This remarkable innovation transforms over 65 well-known hardware synthesizers into extensive hands-on controllers that unlock Omnisphere’s newly expanded synthesis capabilities. Simply put, this ground-breaking feature makes using Omnisphere feel just like using a hardware synth! By bridging the physical experience gap between software and hardware, users gain intuitive control of Omnisphere by using the familiar layout of their supported hardware synth. Virtual instrument users can now experience the joy of the hardware synth workflow and hardware synth users can fully expand their capabilities into the vast sonic world of Omnisphere! Omnisphere 2.0 comes a vast array of new synthesis possibilities including the ability to import your own audio content as a sound source inside Omnisphere giving you limitless sound creation possibilities using your own sample library. The new Granular Synthesis algorithm will allow you to completely transform the included content or morph your own audio into unimaginable soundscapes. Try changing a smooth Jazz recording into an ethereal soundscape or even a blazing synth lead with just a few parameter tweaks. The possibilities are endless! Not many people realize, but Omnisphere can also create purely synthetic sounds without using any samples at all. There are now over 400 DSP waveforms for the synth oscillator, which is 100 times more than the original version, and each waveform is now a Morphing Wavetable with vast new possibilities and colors. A patch can have up to 10 oscillators and each oscillator can have its own wavetable, so you can see how complex you can get in your sound designing. Unison has also been improved with new analog drift behavior that makes an ordinary synth sound absolutely huge! Both FM and Ring Modulation can go much deeper than before too. There™s also eight new filter types and expanded modulation features that will shape your sound into exactly what you need, or better yet something you™ve never even imagined! If you'e wondering about sounds and patches, Omnisphere 2.0 has over 10,000 of them. There are more than 3,000 new patches and Soundsources from the acclaimed Spectrasonics Sound Design Team; a new Omnisphere EDM library with cutting-edge, modern sounds; exclusive Soundsources from Diego Stocco's custom built instruments; a new category of phrase-based Soundsources for granular synthesis; hundreds of new Circuit Bent Soundsources; innovative new Psychoacoustic Soundsources; melodic cave stalactites Soundsources; and so much more. Spectrasonics has always found the wildest ways to bring new sound content to their instruments, and their Psychoacoustic Soundsources are the core of Omnisphere 2.0™s sonic identity. This includes some of the rarest instruments and objects that have never been sampled before, and they find all kinds of unconventional ways to bow, pluck, strike and excite them using objects like electric toothbrushes, sugar packets, coins, zip ties and more. Omnisphere 2.0 adopts a similar aesthetic to the previous version with the exception of a new wider user interface that hosts many improvements. There™s a new Show Modulation pane that opens to show all the modulation routings/sources right in the interface, and a new Mini-Browser feature is available at all times so you can search for just the right sound or patch to inspire any moment. In addition to the interface updates, Omnipshere 2.0 features an enhanced browsing experience that makes finding the right content fast and easy. New in v2.0 is a Sound Match feature that instantly locates any related sounds in the library that match the sound you'e currently using. This makes a huge improvement for finding the right sound in the moment. Another exciting new browser feature is Sound Lock, which allows you to lock a specific attribute from a sound as you browse. For example, lock the arpeggiator pattern from a sound you like and it will be applied to every sound you browse through, or lock-in the effects rack from a patch you like and it will be instantly carried over t each new sound as you browse. This is an incredibly easy and fun way to have as many custom variations as you like, and each one is something that no one else will have. In Omnisphere 2.0 Spectrasonics has dramatically increased the effects rack with 25 new effects including vintage modulation effects, new distortion and classic amp modeling, envelope filtering effects, new studio-grade compressors and equalizers, and some radically new creative effects. There™s also hundreds of new effects presets and racks available for you to pick from, or create your own by stacking up to 16 effects of your choice per patch.